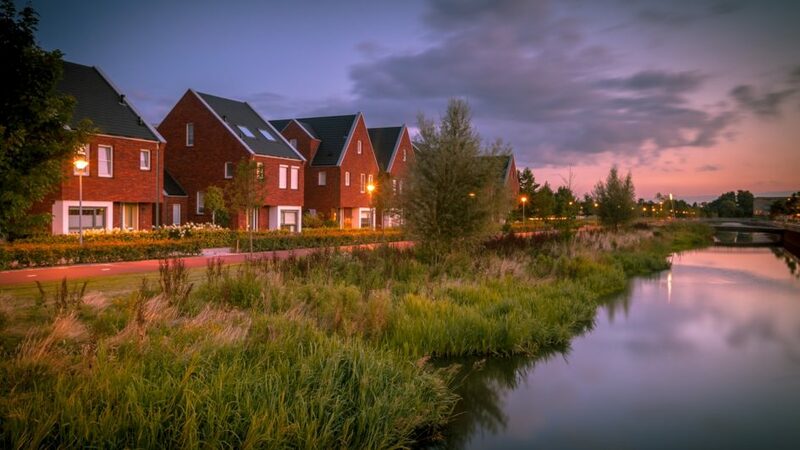 Long exposure night image of suburban Street with modern ecological family houses with eco friendly river bank in Veenendaal city, Netherlands. Throughout history, such issues have been addressed by conventional solutions, that is, improvements of human nature that do not overly alter human faculties. However, historically, it is clear that humanity has always struggled to implement these solutions and reconcile its nature, the nature of its society and the works it has sought to construct. Initially partaking of simple tools and tasks, humanity’s efforts complicated over time, given enough development and consideration; this sophistication of society made it unintuitive, beyond the capability of the uninitiated. To solve this this lack of available aptitude, society introduced means of instruction, though this in turn demands of the economy, causing conflict over the particulars of such an arrangement. These issues were further compounded over other disputes of societal organisation, such as individual rights, familial and cultural formations and their sustenance, schemes of capital flow and distributions of labour. Thus, such conventional solutions are considered insufficient in compensating for humanity’s inadequacy in achieving civilization. Despite this, one returns to the matter of labour, as it concerns two of the largestscale solutions attempted within modern society: industrialization and automation. Here labour is classified into two categories, organic labour and synthetic labour. The distinction is, intuitively, that organic labour is any labour devised and/or enacted by an organic source while synthetic labour is the same such labour, only derived from an artificial source. Any industry with both kinds of labour working in tandem is mixed labour, thus industrialization largely constitutes mixed labour. Similarly, any labour done entirely synthetically is considered automation. These two phenomena are implemented differently in different instances, but they ultimately concern solving economic problems. Between organic and synthetic sources of labour, organic life is the less efficient as it evolves over time to adapt to specific environments, and in some cases even adapt unnecessary features. The process is erratic, time-consuming and uses elimination of genetic material from the genepool as a means of optimisation. Such a method is highly disagreeable considering the resultant uncertainty and delay in one’s utility, as well as one’s self-preservation instinct; in any society approaching civil discourse and orderly conduct, such qualities being conducive to commerce, labour and agreement, one would think it better to avoid such a brutal technique. Indeed, society has developed conventional solutions such as education, training, etc. as a quicker, more efficient means of improving organic labour, though these methods still prove inadequate in civilizing society, as previously stated. with organic life costing years of sustenance, while synthetic labour costs the value of the materials and/or manufacture. The uncivilization in using synthetic labour, and its involvement in mixed labour practices, varies depending on the extent synthetic labour causes insolvency. That societies and their leadership retain organic labour, even in mixed labour, is a display of the citizenry’s reluctance to obsolete itself, as their social contracts lack terms to provide for insolvent citizens and, in extreme cases of redundancy, retain a civil, or even stable, economy. Hence, the degree to which synthetic labour civilizes or uncivilizes an economy depends on how it is implemented. Assuming a civil contract, implementation of these solutions is most likely to succeed given terms that minimize insolvency; however, while synthetic labour promises improvement over human faculty, it is still beholden to autonomy, including uncivil intent. As such, any contract that eschews organic labour outright for synthetic labour without considering obsoleted citizens will result in mass disagreement and contravention of the contract, possibly even violently so. Such a result uncivilizes society, though even agreeable implementation can be susceptible to uncivilization. Thus, any industrialization or automation implemented under a contract that, even if intending to be civil, ultimately impairs the economy in one or more ways will cause uncivilization. Indeed, any such arrangement that does not account for human faculties when substituting synthetic labour for organic labour fails to truly solve the economic problems arising from human nature. The alternative to these solutions is the invasive alteration of human faculties, which leads one to the focus of this text: Transhumanism. Whereas before one considered solutions such as industrialization and automation as a means of supplementing organic labour with synthetic labour, Transhumanism attempts a similar end by combining synthetic and organic labour through human augmentation, effectively industrializing and automating human faculties. This overlap obfuscates the previous definitions of labour, as augmentations are both organic, synthetic and mixed labour all at once. However, one refers back to synthetic labour being defined as the action of an artificial source. As augmentations alter organic labour, such labour becomes artificially enhanced, and so is an artificial source of labour, and so classed as synthetic labour. Thus, in pursuit of definite civil contracts, one now turns to the aims, methods and consequences of Transhumanism as it pertains to society and its civilization.